Are you a Twitter enthusiast? Do you love to interact with your 'friends'? Now, thanks to Crowded Ink, you can have your Twitter followers around you all the time. 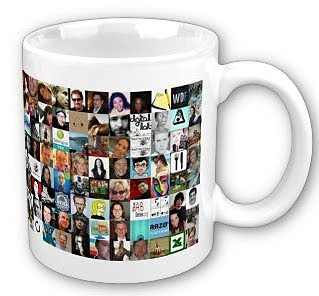 For $15 you can buy a mug jam-packed with the profile pics of everyone you follow. The picture above is a mug with my Twitter friends. I know about half those people! My face must be on the other side of your cup. Yes, indeed you are, Miss Cellania. i ordered one, then they canceled due "to objectional content" i guess they didn't care for some of my followers.